Start your search with Commercial Real Estate. Find your next commercial property for sale or lease. Get a bird’s eye view of commercial properties and real estate that fit your needs. 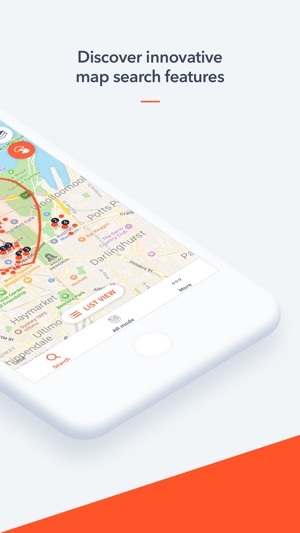 Tap on the orange pins and we’ll show you important details you need to know like address, land size and commercial property type. Have a specific area in mind? Draw it with your finger on the map and we’ll pull up available commercial properties in that space. Once you’ve found an industrial or commercial property you like, add it to your shortlist and we’ll keep track of them for you. We’ll also help you call or email the commercial real estate agent with the tap of a button. Need someone’s approval for lease that you’ve found? 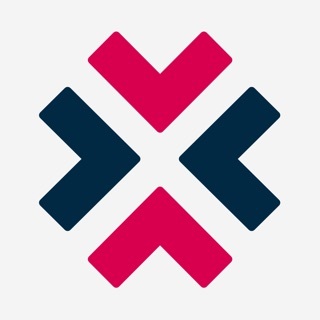 We’ve made it easy to send links to your colleagues so they can see the industrial or commercial property for themselves before you take things to the next step. Your next office space could be right before your eyes. 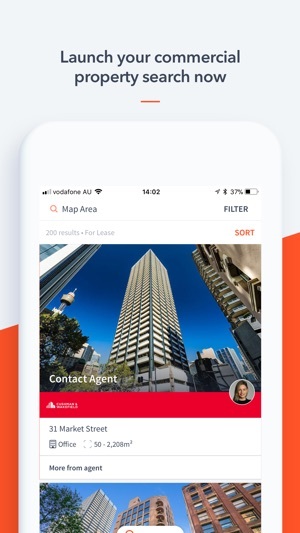 Our Commercial Real Estate augmented reality feature scours your surroundings to find your next commercial property for sale, office for lease or office for rent that matches your search criteria. Wherever you are or wherever you want your next commercial opportunity to be, we’ll point out available industrial and commercial properties that are right there before your eyes, and show you key details about them. 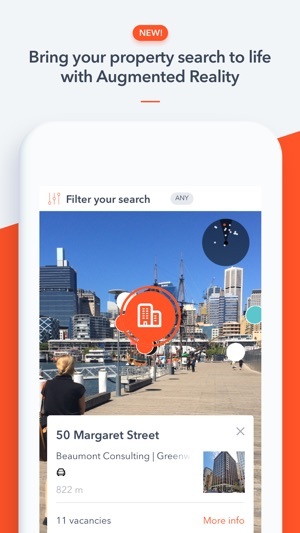 Use the filters to tell us which amenities we should be looking out for, like bike racks, wifi and of course cafes. As part of Domain Group, Commercial Real Estate is the piece of the property puzzle that helps connect Australians with the right commercial property for sale or lease. Whether it be a high yielding investment, office/retail premises to lease, or an industrial or commercial real estate opportunity, we leverage our connections within Domain Group to bring you the information you need to get right down to business. That’s just a little bit of what we have in store for you. 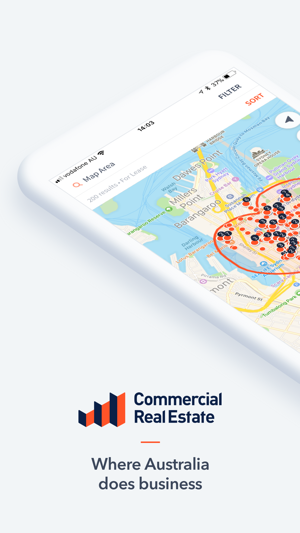 Download the app to see for yourself why Commercial Real Estate is where Australia does business, and please email us with any feedback or suggestions at support@commercialrealestate.com.au. This is amazing. It seems that Commercial Real Estate has done it again. 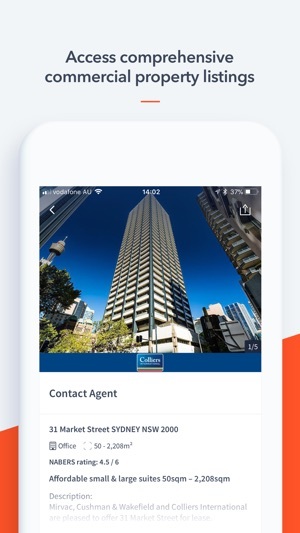 Not only do they offer me the easiest way to find a building for my business, but they also integrate new and exciting features like AR to stay on top of the game. Beats everything else out there. Just found this on the App Store. The best looking and functioning commercial website now has an app that's as equally easy to use. Overall good app but my shortlist has been broken for the past week which is very annoying, if it’s not fixed soon will probably move to another app.